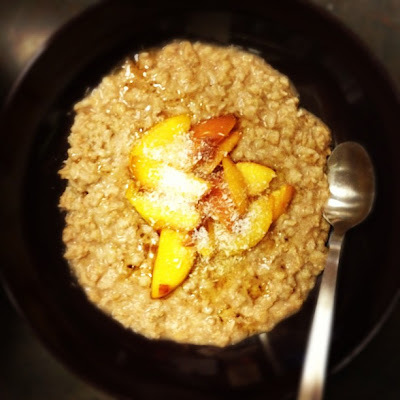 I put too much cinnamon and used peaches instead of nectarines because I got locally grown Colorado peaches on super sale at Whole Foods, but otherwise, I give you Coconut Breakfast Oatmeal with Sautéed Peaches and Maple Syrup (sourced from the newest Whole Living magazine). Next up? Photos of the coconut/almond ice cream I made last night. It's mint-chip. Be jealous.